Governor Cuomo attended the ribbon cutting for the National Comedy Center in Jamestown. The new National Comedy Center, the first non-profit cultural institution and visitor experience dedicated to comedy, is officially open in Jamestown, Chautauqua County. The $50 million state-of-the-art museum is dedicated to telling the vital story of comedy in America, and celebrates comedy's great minds and unique voices, from Charlie Chaplin to Dave Chappelle. 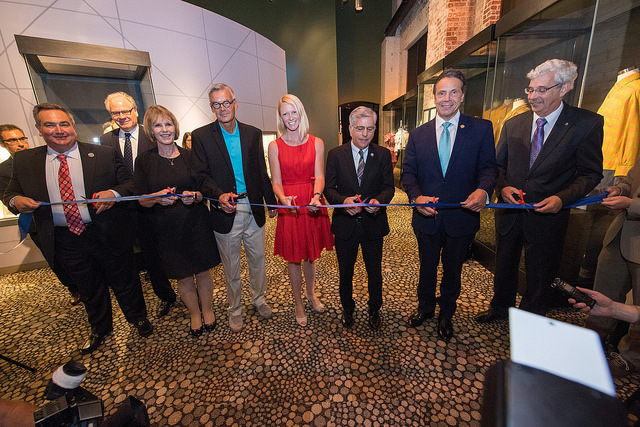 Construction of the project, which began when the Governor broke ground in August 2015, included a new 6,000 square-foot building, which, combined with the renovation and adaptive reuse of two historic buildings, including the historic Jamestown Gateway Train Station, makes up the total 37,000 square feet of exhibit space. The exclusive collections and more than 50 immersive world class exhibits focus on everything from late night comedy to slap stick, and humor as a powerful means for social activism. Visitors are taken on an interactive journey through comedy history, from early vaudeville acts to the latest viral memes. Cutting edge personalization technology is used to create a humor profile that is embedded onto a radio-frequency ID wristband for each visitor. This allows for customization of the exhibit experiences, and encourages reflection on, and education in, one's own sense of humor. It is one of the most technologically advanced attractions of its kind, and also touts a cash bar, and a Blue Room — where the more adult rated or off-color comedy can be found. There are also personal archives on display from people including Lenny Bruce, Rodney Dangerfield, the Marx Brothers, Charlie Chaplin, Jerry Lewis, Joan Rivers, Phyllis Diller, Jerry Seinfeld, George Carlin and more. Visitors will leave the museum with a profound appreciation for comedy icons and innovators, as well as the tremendous influence of humor on how we think, live and laugh. The National Comedy Center is supported by over $14 million in resources from the state, including $4.4 million awarded through a competitive, community-driven process with the Western New York Regional Economic Development Council; an additional $5 million through the Buffalo Billion II initiative; $5 million via New Markets Tax Credit Program; and other state sources. The National Comedy Center will place Jamestown, NY on the national and worldwide map in the comedy industry by leveraging the area’s history and legacy as the birthplace and childhood hometown of comedian and actress Lucille Ball. It is the first complex in the United States dedicated to the art of comedy. It is expected to attract more than 114,000 visitors each year and give a $23 million boost to the local economy annually, while also sparking further economic development and helping to improve the economic environment in the region. The National Comedy Center is anticipated to support over 200 jobs and generate $6.5 million in wages annually across Chautauqua, Cattaraugus and Erie counties. Open seven days a week! Learn more here.